In 2010, USA Ultimate formalized its first regular season and that was when the Pie Queens BURST onto the national scene with a 5th place finish at the D-I College National Championships in Madison, Wisconsin. In the following two years, the Pie Queens finished 11th and 9th at Nationals respectively! The Queens returned to Nationals in 2016 in Raleigh with a tied 9th place finish. In the Fall, everyone is a Pie Queen! We play together, compete in tournaments, and have plenty of fun. Why are we called the Pie Queen﻿s? 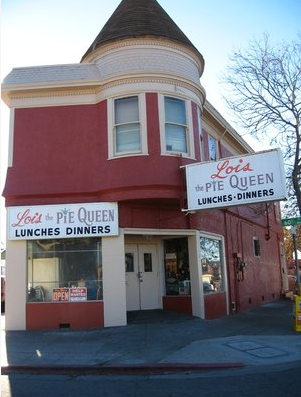 A long, long time ago, the UC Berkeley women's ultimate team decided to stop at Lois the Pie Queen in Oakland, CA for some food after a fantastic weekend of ultimate. They had never been to this slice of heaven before, so they were excited to find that Lois served some good ol' soul food. It just so happened that one particular item stood out above the rest... THE PIES! There was apple, sweet potato, lemon ice box, berry, cherry, pecan...the list goes on! ﻿These pies were the best. things. ever. and so, our team decided to name ourselves after Lois the Pie Queen and have been loyal customers ever since!